01:10:00 Makes 4 servings, 1/4 recipe (225 g) each. Makes 4 servings, 1/4 recipe (225 g) each. 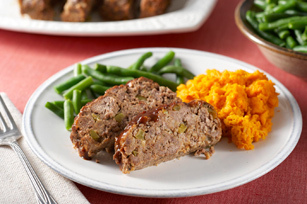 Stuffing mix makes this meatloaf moist and delicious but the barbecue sauce gives it a punch of flavour. This recipe is sure to become a weeknight staple. Whisk egg and water in large bowl until well blended. Add all remaining ingredients except 2 Tbsp. barbecue sauce; mix well. Press into 9x5-inch loaf pan; brush with remaining barbecue sauce. Bake 1 hour or until done (160ºF). Let stand 10 min. before slicing. Serve with a small cooked sweet potato and steamed green beans or broccoli. To thaw frozen ground beef safely, keep meat wrapped and thaw on bottom shelf of refrigerator, not on the countertop. Serving Size Makes 4 servings, 1/4 recipe (225 g) each.